In recent years, Italy has become one of the planet’s more productive nations when it comes to providing the rest of us with phenomenally fantastic, heavy stoner rock bands. That fact is probably also relative to the existence of the Argonauta Records label, an Italian based outlet now in their fifth year of assisting to get bands, Italian or otherwise, out to the masses. As always, the label repeatedly rises to that challenge, and the subjects of today’s review are a prime example of that mission. SONS OF LAZARETH – Leonardo Riccioni (guitar / backing vocals), Alessandro D’Amato (voice / guitar), Marcello Pinna (bass / guitar), and Marco Gambarini (drums) – are a quartet that hail from the boot shaped Bel Paesa land and they recently released their full-length début, ‘Blue Skies Back To Gray‘, through the label. The album is an immersive ten song offering of infectious desert rock, rippling with influences from such acts as Queens Of The Stone Age, Soundgarden, and Baroness. The tracks contained on it are emotionally augmented numbers that encapsulate such strengths as riveting guitars and powerful, solid rhythmic presentations. On top of that, there are gratifying vocals running a wide gamut of dynamic ranges, ones soaring in elevated heights upon this remarkable music. Some of the album’s more alluring moments are achieved with pristine cuts, like the uplifting rocker, “Escape To Nowhere“, or the headstrong blues of “Hallee Road“. Then there is the soulful and nuanced “Fragile“, the heavy-handed, metallic grunge thunderer “Don’t Come Looking For Me (Cut The Crap)“, or even the sweltering intro piece that starts things off, “Palm Desert’s Blues“. Of course, all of those are grand compositions, but there are some superb stand outs that must also be experienced, beginning with “Vultures“. Thick, fuzz-dense riffs rumble throughout the song’s verses of gruffly sung vocals, breaking that cycle with a more melodic fare for the headier choruses and ultimately resulting in quite a feel-good song, indeed. Speaking of feeling good, one of the stand out tracks is certainly “Punctually Late“, an uptempo foray that lays into you with non-stop grooves, while it hits you with one hook after another. 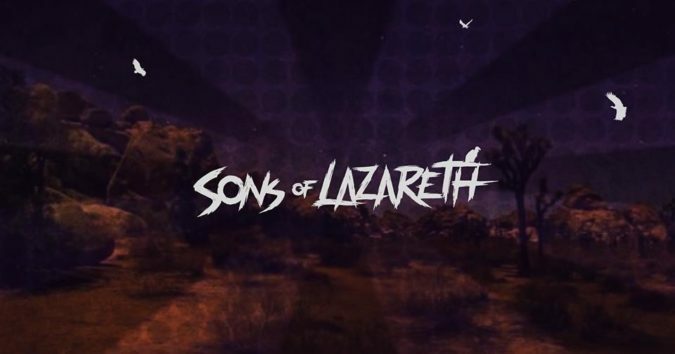 Replete with energized solos, this is one damned spectacular song, also one that demonstrates the undeniable commercial qualities the SONS OF LAZARETH‘s music emanates with. Yes, the usually quite dreaded “C” word is nothing to fear or despise when it happens to come in the form of such enjoyable music as this. It is rich with flavorful texturing, so much so that it can be intoxicating at times, yet thankfully never sappy, mundane, or complacent. Stream the SONS OF LAZARETH ‘Blue Skies Back To Gray‘ album here in the review… out now from Argonauta Records!